Scotland’s unsurpassed landscapes have long been widely acclaimed all around the world. A diverse geography makes Scotland a unique place that is good for living, visiting, film making or weddings. From cities that have great quality green spaces (like Holyrood Park in Edinburgh) to sparsely populated islands, from rural lowlands to breathtaking uplands and magnificent highlands, Scotland has a lot to offer, whatever your needs are. No wonder then that many couples choose Scotland as their perfect place to tie the knot, whether they live here or they want an exciting elopement and come from far away. 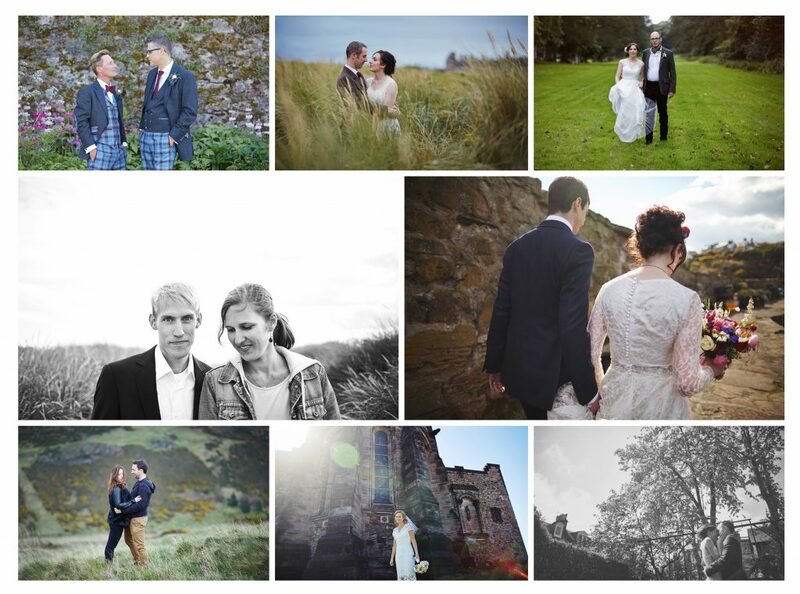 As Scotland wedding photographer I’ve been to many places, castles and other venues to capture ceremonies, each of them different and exceptional. Through my documentary and story telling approach I catch the unique moments and generally shoot in an unposed, natural style. I like going to places and venues I haven’t been yet and whenever I get a chance to shoot in rather unlike and alternative venues, I am really pleased. If a couple wants to escape traditional hotel wedding and fancies something fresh and different, I am in. One of the superb ideas are barn weddings. Sounds a bit odd? Not at all. Scotland offers quite a few fabulous barn and byre wedding venues that will turn your special day into an unforgettable and distinctive event. Kinkell Byre is one of the places worth mentioning. This venue is situated on the coast to the south and east of St Andrews, not that far from Edinburgh (just a little bit over 1 hour drive). It is an old byre transformed into versatile and remarkable venue for various events, and is particularly popular for weddings. The building dates back to the 18th century and was partly constructed using old stones from former Kinkell Castle. The venue offers 4 event areas and two largest rooms with spacious wooden floor are just perfect for weddings. There’s plenty of space for tables, chairs and dancing. Apart from the space you need, Kinkell Byre has a rustic charm and superb surroundings just a short walk from the coast. The Byre at Inchyra is another great venue, located in the heart of Perthshire. About an hour drive from Glasgow and Edinburgh, this atmospheric barn is a place that many couples surely will find a perfect wedding venue. Walls are made with sandstone and granite, roofs are timbered and there are extra details too: original old barn doors on the walls outside, that can be swing closed in the evening to create unique atmosphere. There’s plenty of space to accommodate your guests for dining and dancing. The Byre at Inchyra offers a ceremony in its beautiful large garden and you can pick a tree to marry beneath: apple, chestnut, plum, oak and more. Idyllic, simple yet stylish, it makes a fantastic spot for a reportage wedding photography and also story telling. If you are adventurous and fancy a wedding far far away, then Ackergill Tower is a venue for you. Situated in a remote yet astounding part of Scotland - Wick, Scottish Highlands, presumably one of the wildest locations in Europe, this venue guarantees spectacular views and exceptional event organisation. It’s natural surroundings make Ackergill Tower a truly hidden gem amongst other venues. The place dates back to late 15th century and was stylishly renovated and turned into luxurious and welcoming 5 star hotel. Ackergill Tower is easily accessible from Inverness. The castle itself, magnificent 3,000 acre estate and views over the Caithness coast set an unforgettable scene for every couple’s biggest day. So if you are looking for for utterly bewitching location, that’s the place for you. From other castle venues that seem just ideal for tying the knot I’d definitely go for Boturich Castle. Set on the banks of beautiful Loch Lomond, with spectacular views on the loch and nearby hills and just 40 minutes drive from Glasgow and 1 hour from Edinburgh, this place is exceptionally attractive and elegant. Venue is run by its owners, who are always happy to assist you - whatever you need. You can get married in the garden, or nearby the loch bank, and have a unique experience you and your guests will never forget. From photographer’s point of view, this location is just perfect for documentary wedding photography. It’s also definitely worth to check out Guthrie Castle. Located in Angus, between Dundee and Aberdeen, is an impressive and truly romantic castle that was built in 15th century. You can take your vows in ih the Castle, in the small yet gorgeous castle chapel, in Guthrie Village Church, or have outdoor ceremony in walled castle garden. For your reception you can use castle’s own Pavilion, that was built particularly for holding weddings and can sit up to 250 guests. The Pavilion also offers large dance floor and was decorated to suit any colour theme. Beautiful garden makes a fantastic spot for wedding photography and I am sure all couples would enjoy having their relaxed photo session in there. And finally, I think that another venue that is truly remarkable is House for an Art Lover in Glasgow. Designed by the internationally famous architect Charles Rennie Mackintosh and built in 1989 within wonderful grounds of Bellahouston Park this venue is versatile and highly popular for many events. Location is just great - it’s only 10 minutes from Glasgow City Centre. House for an Art Lover is well known for it’s Mackintosh Suite that is just perfect for wedding ceremonies. It combines double height entrance hall, few stylish rooms - dining room, oval room and music room - and impressive main staircase. For your ceremony best rooms would be music room or interconnected main hall and dinning room. Music room, with it’s nice fireplace and piano, works well in few various layouts and suits ceremonies with up to 110 guests. The interconnected rooms give you quite large space and also few layout options and came accommodate up to 110 guests. The Mackintosh Suite is definitely an exquisite and flexible wedding venue. I’d love to document wedding ceremonies at these particular venues in Scotland. With my relaxed and unobtrusive approach, your wedding day will be like a story written with photos and every time you look at them, you will travel in time and be reminded of a truly special day of your life. That is what I love about photography, the photographs will always bring back memories.